HomeCompetitionsWIN: A chance to see SNEAKBO at The Oh Yeah Centre, Belfast on Thursday 29th November 2018. 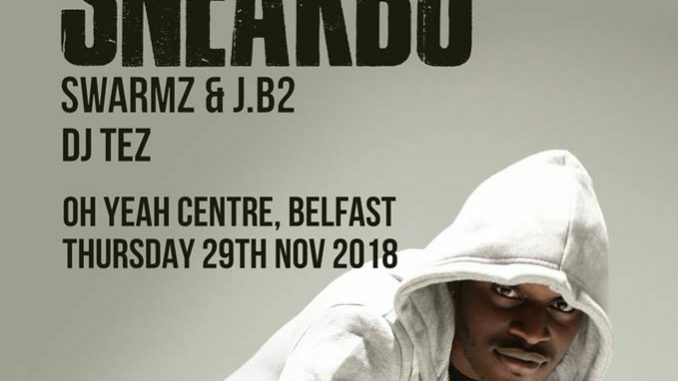 WIN: A chance to see SNEAKBO at The Oh Yeah Centre, Belfast on Thursday 29th November 2018. Rising from Brixton (South London) Sneakbo is pleased to announce a headline Belfast Show at Oh Yeah Centre on Thursday 29th November 2018 and we are giving a lucky winner the chance to see this amazing show. For a chance to win, simply LIKE, SHARE & RETWEET via the social media links below. Competition CLOSES MIDDAY Thursday 29th November 2018. Winners will be notified via social media. Sneakbo attracted the attention of Drake early in his career, who was “inspired by his Movement”, this later led to him being featured in The Guardian’s New Band of The Day in 2013, he had followed up success with 3 independently released top 40 singles (Zim Zimma, Ring a Ling and Dr Who). Sneakbo also featured on “Oliver Twist” by D Banj which was in the top 10 UK official charts. He has gone on to do many musical collaborations with Wizkid, Moelogo, Krept & Konan, Yungen, Chip Fekky, Stormzy, Tinie Tempah and, more recently Giggs, with the video views to “Active” reaching almost 3.5 million and placement on the Fifa 18 video game. Tickets on sale NOW from www.shine.net, www.ticketmaster.ie, Katy’s Bar & Ticketmaster outlets nationwide. Northern Ireland customers 0844 277 44 55.